Here is the complete source of information on egg handling, processing, and utilization. 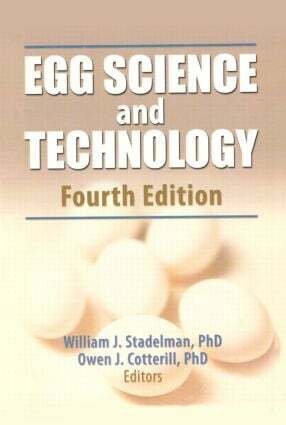 Egg Science and Technology, Fourth Edition covers all aspects of grading, packaging, and merchandising of shell eggs. Full of the information necessary to stay current in the field, Egg Science and Technology remains the essential reference for everyone involved in the egg industry. In this updated guide, experts in the field review the egg industry and examine egg production practices, quality identification and control, egg and egg product chemistry, and specialized processes such as freezing, pasteurization, desugarization, and dehydration. This updated edition explores new and recent trends in the industry and new material on the microbiology of shell eggs, and it presents a brand-new chapter on value-added products. Readers can seek out the most current information available in all areas of egg handling and discover totally new material relative to fractionation of egg components for high value, nonfood uses. Egg Science and Technology is a must-have reference for agricultural libraries. It is also an excellent text for upper-level undergraduate and graduate courses in food science, animal science, and poultry departments and is an ideal guide for professionals in related food industries, regulatory agencies, and research groups.